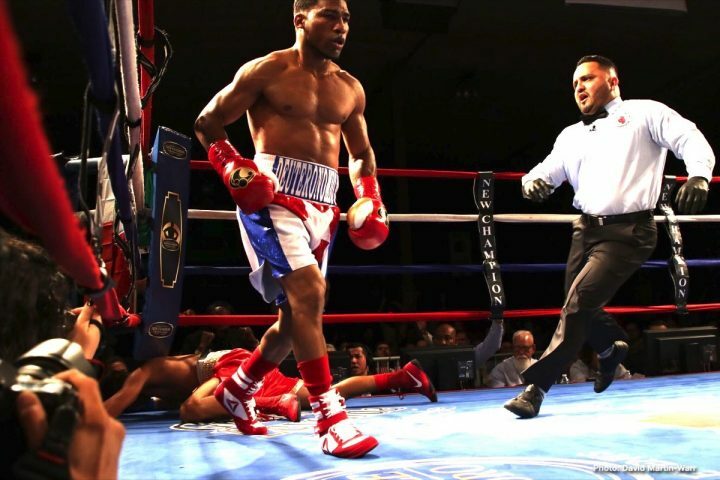 By Aragon Garcia: Premier Boxing Champions have signed former IBF/WBA featherweight champion Yuriorkis Gamboa (29-2, 17 KOs) to a multi-fight deal with their stable, according to Mike Coppinger. Gamboa, 37, is just one of the big names that PBC has signed. They also have inked former two division world champion Marcos Maidana to their stable. PBC has big plans for Gamboa, who captured a gold medal for Cuba in the 2004 Olympics. Gamboa will be fighting in the spring against an opponent still to be determined before coming back later this year to fight for a world title against either WBA Super World featherweight champion Leo Santa Cruz or WBA Super World super featherweight champion Gervonta ‘Tank’ Davis. Given that Gamboa hasn’t fought in the 126 lb weight division in eight years since his 3rd round knockout win over Jorge Solis in November 2011, it would seem more likely that he would challenge Gervonta at 130 for his WBA belt than for him to melt down from the lightweight division [135 lbs] nine pounds to face Santa Cruz for his WBA title at 126. Gamboa’s first fight of his multi-fight deal with Premier Boxing Champions is expected to take place at super featherweight, which will put him in position to take on Gervonta later this year. Santa Cruz is expected to move up to 130 at the end of 2019 if he can’t get the unification fights that he wants at featherweight against Oscar Valdez, Gary Russell Jr. or Josh Warrington. Santa Cruz wants the bigger fights, and one way for him to accomplish that goal is to move up to super featherweight to take on the hard hitting Mayweather Promotions star Tank Davis before he moves up to lightweight. Davis isn’t expected to stay at super featherweight for too much longer before he makes the move to go up to lightweight to take on Top Rank Boxing star Vasyl Lomachenko for his titles. Despite being a fighter with major talent, Gamboa has seen his career slow to a crawl due to inactivity since losing to the much bigger Terence Crawford in an ill advised fight at lightweight in 2014. Gamboa was too small to be fighting at lightweight, and he was beaten on size alone by Crawford. After that loss, Gamboa remained at lightweight and suffered another loss, this time to high level journeyman Robinson Castellanos in 2017. Gamboa was knocked down twice by Castellanos before the fight was halted in the 9th round. That loss for Gamboa can be attributed to a combination of ring rust, age and lack of size. Gamboa is not a cut out for the lightweight division, no matter how you want to twist it. His bet weight class is featherweight, period. Gamboa’s problems inside the ring inside the ring in recent years are a direct result of him not staying active and his decision to fight in weight classes that aren’t ideal for his body. Most fighters would do everything they could to get their weight back down low enough for them to fight in a division where they have their best chances for success, but Gamboa hasn’t done that. He’s chosen to fight two divisions above his best fighting weight at lightweight, and he’s struggled. Since his loss to Castellanos two years ago, Gamboa has won his last three fights in beating Alexis Reyes, Jason Sosa and Miguel Beltran Jr. Those are good fighters. Sosa is a former WBA super featherweight champion, who has seen better days. Still, Gamboa is not a super featherweight, and he’s going to have problem when or if he gets inside the ring with Gervonta Davis at 130. That’s a fight that would have been ideal for Gamboa to make years ago when he was still at 126, but not now. The payday will be good for Gamboa though in facing Davis or Santa Cruz. At least he’ll have that going for him. At 37, Gamboa has lost a lot of the blazing hand speed that he once had going for him. That’s a product of age and his years of fighting irregularly. Whether that’s Gamboa’s promoters fault or is own is debatable. Gamboa was signed with 50 Cent, and not fighting. His career stalled out from inactivity. Gamboa could have achieved a lot more than he did if he had been kept busy fighting three times a year, and if he’d stayed at featherweight where he was at his best. Being inactivity though have had to have made it hard on Gamboa to keep his weight low enough for him to fight at featherweight. Gamboa hasn’t fought enough for him to keep his weight down. There were some great fights that could have happened years ago. One of them was a match that was talked of between him and Juan Manuel Lopez. Top Rank made a mistake of letting the Lopez-Gamboa fight marinate for too long, and Lopez ended up losing twice to Orlando Salido. Lopez’s career has never been the same since those defeats. Premier Boxing Champions boss Al Haymon has been signing some good guys lately in inking Manny Pacquiao, Marcos Maidana and now Gamboa. He’s got quite a crew of fighters. He’s turned Pacquiao into a world champion once again and it remains to be seen what he can do with salvaging Maidana’s career. If Haymon can get Maidana a world title, and then do the same thing for Gamboa, he’ll be seen as a genius by boxing fans. That in turn will likely lead to more fighters signing with Haymon to see if he can turn their careers around as well.